Many cameras from the era between the late 60s - with the introduction of CdS- (Cadmium sulfide-) light meters and the early 80s use mercury oxyde batteries. The big advantage of these batteries is that they deliver a very constant voltage of 1.35 V over their entire lifespan, that they last long, and that this voltage drops suddenly when the battery is decharged. With these characteristics it was possible to manufacture very simple and therefore cheap light meters, because no voltage correction circuits were necessary to compensate for changing battery voltage. With environmental issues becoming more and more important, mercury oxyde batteries were being questioned, as mercury is very toxic an enriches in the environment and especially in the food chain. In the late 80s, international treaties were signed with the aim to stop the use of mercury for many fields of usage. By the environmental laws following these treaties, the production of mercury oxyde batteries was banned in most countries during the 90s. This is a problem for many owners of older cameras, as their light meters are calibrated for the use of mercury oxyde batteries with their typical voltage of 1.35 V. Mercury oxyde batteries are more and more difficult to come by and other battery types with the same size but different chemistry deliver different voltages that lead to light meter mis-measurement that can be several exposure values off the correct meter reading. More modern cameras have compensation circuits and are not affected - but there are literally millions of older cameras around that have been constructed for the use of mercury oxyde batteries. To find out whether your camera is affected or not, you can consult your user's manual or maybe you have to search the internet. If you own a Konica SLR from the era before the introduction of the electronically controlled models, your camera is most likely to be affected, if it has not been re-calibrated already in the past. All old Autoreflex-cameras up to the Autoreflex T3N use mercury oxyde batteries of the PX675 type, the Auto-Reflex , Autoreflex TC, and Autoreflex T4 use mercury oxyde batteries of the PX625 type. The meterless Auto-Reflex P has no battery. 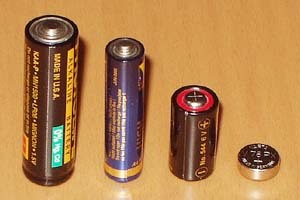 Cameras models FS-1, FT-1, and TC-X use alkaline batteries of the type AA or AAA - depending on model and version. The FC-1 uses either silver oxyde batteries of the type SR44 or alkaline batteries of the type LR44, the FP-1 uses either a silver oxyde battery of the type 4SR44 (Eveready 544) or an alkaline battery of the type 4LR44 (Eveready 537), whichever you prefer. All these batteries are readily available and there is no problem with battery supply. With the older camera models F, FS, FSW, and FP there is no problem either - they do not need any battery at all. Of the Konica SLRs with the first »F«-bayonet only the FM needs mercury oxyde batteries, one of type PX13. Mercury oxyde batteries typically have a voltage of 1.35 V. They keep this voltage quite constant over their entire lifespan and last for a long time. They are not produced any more and get more and more difficult to come by, at least in North America and Western Europe. Silver oxyde batteries typically have a voltage of 1.55 V. Their advantage is that their characteristics are similar to mercury oxyde batteries, especially that they keep their output voltage quite constant over the entire lifespan and that they last relatively long. Zinc-air batteries mainly for hearing aids have also quite constant voltage output, typically 1.4 V. This is quite close to the voltage of mercury oxyde batteries, so that they can be used as a substitute without making any changes on the meter circuits. They are quite cheap. One problem is their rather short life span of only 2 to 3 months, not depending on usage. When taken into service, a seal has to be taken off the battery. Once this seal is removed, they dry out inevitably, even when not used. When first taken into service, new zinc-air batteries need quite a long time of approx. half an hour up to one hour until they achieve their correct output voltage. In this time they can cause incorrect meter readings. Wein Cells from photo equipment dealers are basically zinc-air batteries with fewer ventilation holes to achieve a longer lifespan (approx. 6 to 12 months), as they do not dry out as quickly as normal hearing aid batteries. They have a smaller maximum power output than zinc-air batteries, but for photographic equipment this is not a problem, as the meters do not need much power. Wein Cells are very expensive and are quite difficult to get in some places. They have the same problem with the initial voltage as normal zinc-air batteries. Alkaline batteries are available almost everywhere and are quite cheap. Alkaline batteries have an output voltage that drops continously over the lifespan of the battery, as it decharges - the initial voltage is approx. 1.5 V. They are not a good substitute for the mercury oxyde batteries because of the changing voltage - there is no possibility to compensate for the voltage changes in older cameras. Even if you would succeed to calibrate your meter for the initial higher voltage of an alkaline battery, the longer you use your battery, your meter would be more and more off the correct value. Alkaline batteries should therefore only be used in cameras constructed for use with this battery type in the first place, and that have voltage compensation circuits and do not depend on constant voltage output of the battery. A re-calibration of the light meter for usage of 1.55 V silver oxyde batteries is the most secure solution and the easiest to work with. After the re-calibration, the silver oxyde batteries can substitute the mercury oxyde batteries without any limitations. The re-calibration can, in most cases, only be done by a skilled service with the necessary equipment, you have to bring the camera to a service workshop for this. Thus, this solution tends to be expensive. Unfortunately, not all cameras can be re-calibrated. But if it works with your camera and if you want to spend the money, the re-calibration is a good solution. Voltage reduction with diodes is a method which is quite reliable and brings good results. Over a diode, the voltage drops - with the right kind of diode, it is possible to get an output voltage of approx. 1.35 V from the 1.55 V silver oxyde battery. If you are not afraid of a soldering iron, you can make this fix often at home, otherwise this is a case for a service technician, too. As a replacement for several battery types like the PX625, you can buy ready-made battery adapters (C.R.I.S. or Gossen), or it is possible to home-make one out of an old alkaline battery case (which is cheap, but quite a lot of work; Never open a mercury oxyde battery - the contents is very toxic!). The usage of battery adapters has the advantage that no alterations on the camera is necessary, which might be especially interesting for collectors. This method is easy to use and quite cheap if you nee to fix several cameras with the same battery type, as you only need one set of battery adapters, if you do not need to use them simultaneously. When choosing the built-in method, the diodes are soldered into the cables to the battery compartment. Frans de Gruijter has written a very good and technically detailed review about the mercury oxyde battery problem. Included in this text are very good instructions for home-making a battery adapter for PX625 battery replacement. By friendly permission of the author, this article can be downloaded as .pdf file. If desired, you can also purchase ready-made adapters or the parts needed for home-building the adapters from Frans de Gruijter. It's also possible to use the mentioned diode types for soldering into the camera's wiring, if there is not enough space for the use of an adapter (like with PX675 battery type). Further links to informations and supplies for adapters and diodes are on the bottom of this page. The usage of zinc-air batteries has the advantages and disadvantages as described in the battery types paragraph - nothing needs to be altered at the camera, but the batteries need to be changed quite often. Especially when the camera is not used regularly, this is also a quite expensive solution, as the batteries dry out within a few months, even when not used. The Wein Cells last longer but are much more expensive than normal zinc-air batteries - I would rather recommend the usage of cheap hearing aid batteries instead. There is a possibility that zinc-air batteries could not work properly in some cameras with air-tight battery compartments, because the batteries do not get enough air to function. I have never made this experience, though. A very simple and cheap possibility is the adaption of the film speed set on the camera to compensate for the different metering results due to incorrect battery voltage of silver oxyde batteries. To get good results, thorough tests with the film material concerned are necessary and I'm not sure whether the metering fault is constant over the whole metering range and thus the changed setting will bring good results under all lighting conditions. For print negative film with its big exposure tolerances this might be o.k. For slides, which need a very accurate exposure, I do not believe this to be a good solution. Additionally, the range of usable film speeds is limited, as the range of the camera is shifted against the actual film speeds. Personally, I have made very good experiences with the diode solution and can recommend it. Frans de Gruijter (NL) offers ready-made battery adpaters and kits for home-making adapters for use of silver oxyde batteries instead of mercury oxyde batteries. No own website, contact via e-mail. You'll find his e-mail address in the pdf article. C.R.I.S. Camera Service (USA) offer an assortment of ready-made adapters for replacement of a variety of mercury oxyde batteries. Gossen offer a battery adapter for usage in their hand-held light meter Lunasix 3S, which can be used in some cameras as well. It is for replacement of two batteries of the PX625 type and can only be used in cameras that use two PX625 stacked one on top of each other. Available with specialised dealers..
Rolleicamera.com offer the C.R.I.S. adapter in Europe.